For the last few months, I’ve found myself carrying a full-size laptop around less than I did in the past, and instead using my Nexus 7 more and more. In many respects it’s excellent, and I would (and have) happily recommend it to anyone who’s looking for a 7 inch tablet. Indeed I’m convinced that this smaller form-factor is much the better size. The Nexus 7 lets you read email, feeds, browse the web, read Kindle books, watch video and listen to music very easily. You’re not going to type even a medium sized email on your tablet – unless you’re a little mad. Nevermind longer blog posts, essays, work documents or whatever. My Nexus 7 is fine for assisting alongside a presentation, but not for creating that presentation in the first place. While I do have an Asus 30A which is a fantastic device and something of a pre-cursor to today’s ultrabooks, it’s not machine you’re going to take absolutely everywhere if you want to travel light. So I decided I’d give a Chromebook a go. The most recent machines are remarkably cheap, and of particular interest to me, they’re super-fast booting up. From completely off to useable is less than 10 seconds. But frankly, for most usage you just shut the lid, and the device sparks into life instantly. There are a few Chromebooks out now, and more promised soon. I plumped for the Samsung Chromebook WiFi (as opposed to the more expensive Samsung Chromebook 550). I considered whether it was worth paying extra for a 3G model, but in the end decided that as this was something of an experiment, spending extra cash on 3G was a bit unnecessary. This was a good choice for reasons I’ll come onto. There is a cheaper Acer Chromebook which has a hard drive, but I didn’t go for that model because it has a longer boot up time. And while it has more space onboard, the Samsung model has a longer battery life too. Plus, for extra space there are both USB and SD card slots for offline videos or music. It’s hard to entirely divorce the Chromebook operating system, and Google’s software products from the actual device itself. But I’ll do what I can. The Exynos 5 Dual Processor isn’t going to win any awards for speed, but frankly, that doesn’t really matter. As long as it copes with websites, video playback, and lets you use applications like Drive, then you’re fine with it. The screen is a different question. While the resolution is absolutely fine – 1366 x 768 on an 11.6″ screen – it’s not going to win any awards for brightness. It’s decidedly average, which is to say, worse than average. Little to no money has been spent on it. It’s fit for purpose, but nothing more. And it certainly doesn’t compare with the vividness of something like the Nexus 7 screen. This was particularly noticeable in the Google “store” bit of Currys/PC World where I bought my device. Sitting next to it was the a demonstration model of the Google Pixel. The screen on that is gorgeous, with an incredible pixel density as well. The build quality looks amazing. But it’s £1,049 for essentially the same functionality as a device I bought for £224. More concerning is the build quality. To be frank, it’s not great. While the device is very thin, and the designer has clearly “seen” an Apple MacBook Air, the budget was never going to extend to a brushed aluminium case. Instead, we get a rather poor quality silver case. It’s really not very good though. Just one ten minute walk the Chromebook in my bag without a neoprene case meant marks that couldn’t be removed on the top. I ordered a personalised skin from DecalGirl to cover the marks up – and generally personalise my computer more. If you’re the sort of person who covers their laptop lids with stickers anyway, then this probably isn’t important. I’d note that DecalGirl aside, I didn’t find anyone else with Chromebook specifications available for personalised skins. I’d thoroughly recommend DecalGirl though. Their stickers include one for the keyboard rest, and have precise cutouts for the Chromebook logo. I left the Samsung decal on the lid, and it does show through the vinyl sticker a little. The power supply cord is curiously thin, and it goes in around the back as do the USB sockets. I’m not sure that this is the best place – the sides would be more convenient. And Samsung does love to use a clover configuration power supply rather than the more common figure of eight version. The former includes earth of course, but so many power supplies make do without, it’s a bit annoying, particularly if you want to travel light and use the same power cable for more than one adaptor. I’ve actually bought an inexpensive adaptor to overcome precisely this issue, but it’s a small annoyance nonetheless. I wonder if a device like this mightn’t be chargeable with a micro USB cable in a future version? So what about whether you need to get a 3G version? I said I made the right decision not getting one. But that’s because it’s trivial tethering the Chromebook to your phone, and because things like Google Docs works fine offline, you can quite happily edit documents when you’re disconnected anyway. I’ve used the Chromebook on a few train journeys now, and haven’t felt I’m missing too much not being connected. In practice, the data overhead seems to have been minimised as much as possible by Google, so when you’re typing in a document, you’ll more often than not see that “All changes saved in Drive…” displays at the top of the screen rather than “Saving…” when you are tethered online. WiFi reception is excellent, and I’ve not had any problems hooking up to various public and private WiFi networks anywhere. The device quickly finds them and hooks onto them. The keyboard is perfectly fine, and this was perhaps the biggest concern I had over the cheap build. But you can type on it easily and I didn’t have any issues. Similarly, while the trackpad might not be class leading, it’s fine, and I’ve been happy with it. There are some foibles that come with Chrome’s OS. There’s no delete key on the keyboard – just a backspace. And in place of Caps Lock there’s a search button. This is in particular is no bad thing as Caps Locks keys are perhaps the most underutilised. What would traditionally be Function keys lose the F1-F10 and instead just do things like reload the browser page, turn the brightness or volume up and down etc. Right-hand clicking takes some practice being more of a two finger tap than anything. The arrow keys are tiny, and the power button, being a keyboard key, feels strangely insubstantial. A bigger issue is the screen rubbing against the keyboard when the device is closed. I’ve suffered this before, and it comes if the keyboard touches the screen when the clamshell is shut when the device is being moved around. These marks are in the form of a horizontal line on the screen. At first this was just an irritation meaning I had to keep polishing the screen. But there’s now a small permanent chip in the screen. It’s very tiny, but it’s there. I’ve ended up having to order a silicon keyboard protector. While awaiting that, I went back to the box it came in, and retrieved the very thin bit of foam that came with it originally. This does the trick. Don’t throw yours away. The device has Bluetooth, but it’s not completely developed yet. I tried hooking it up to a Logitech adaptor I use to play music through speakers. But while both my HTC One X and Nexus 7 connect to it fine, the Chromebook won’t. I believe that it’s not a hardware shortcoming, but rather a question of the developers including it. Battery life is broadly speaking as advertised. It’s only about six hours, but the device is slim and light as a consequence. I’ve not really had any issues with it. This is where it’s more about the operating system than the device. The first thing to say is that while a Chromebook is nice to use out and about, or just for surfing on the sofa, it’s not a full replacement operating system in my view. At least it’s not unless you’re requirements are especially minimal. I’ve read articles about people who’ve tried to use only a Chromebook day to day, and it’s all a bit pointless. The OS just isn’t ready for the bigtime yet. Similarly, I’ve heard of people suggesting that companies ditch Microsoft Office and use Google Docs. Well I’m not sure many of the actual power users in your business would thank you for doing that. Ask your accounts department for a starter – they’re probably using Excel far more than you realise. My own usage of Spreadsheets has been primarily for my RAJAR analyses and accompanying charts. Even something as simple as that (and I’m not talking about motion charts) is pretty hit or miss. Trivial things like getting scales to display as you want are difficult to achieve. You end up duplicating data a lot to get multiple charts. It’s a start, but not ready yet. And while the sharing aspects of Google Docs is excellent, the presentation software is still missing some fundamentals. Have you tried embedding audio into a presentation for example? Or getting a speaker view alongside a presentation view? I’m sure that these will come, but just not yet. Similarly, nobody in their right mind would try to attempt video editing or even photo editing on a Chromebook. Yes, you can use web services. And maybe one day Lightroom or Photoshop will exist entirely within a browser. But they don’t currently. So good enough for people for the less demanding, but not for serious use. This all makes it sound very negative. And that’s a little unfair. I knew the shortcomings, and I work within them. In fact, I’m using Google Docs more than ever now since it’s so easy to start typing at a moment’s notice. If I need to do something more complex with fully featured software later, then I can do so. Chrome itself works beautifully, and I’ve not had any problems with any extensions I’ve either already had installed, or have subsequently added. So things like Chrome to Phone, Send to Kindle, Evernote Web Clipper (Google Keep has now launched, but like many bitten by Google Reader, I’m keeping my eggs in another basket) and the rather excellent OneTab. Once you’re signed in, favourites, bookmarks and passwords are passed over. And I’ve had no problems with any websites not working. I did see a warning that Shockwave had crashed on one exception though. The machine has a paltry 2GB onboard memory, but this is a device built for the cloud. Really, that 2GB is only for offline access to files in Google Drive. Google gives you 100GB of free space for two years with your device, so you can access a decent array of files. What happens after your two years expire? I suspect you’ll have to get your credit card out. Or buy a replacement machine. 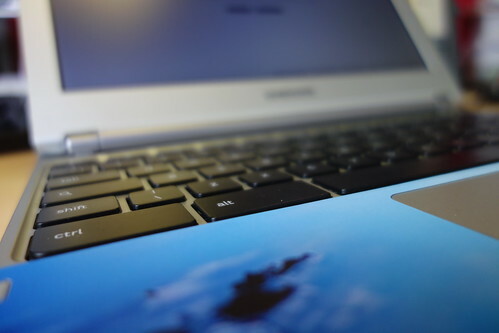 Invariably, some of the shortcomings of Chromebooks are more failings of Google’s ecosystem itself. Here’s an example. If someone emails you a JPG to your Gmail account, and you want to use the image somewhere else, you may want to save the image to your Google Drive. You certainly don’t want to be wasting local disc space with the image. But Google doesn’t let you do that. You have to save the image locally and then re-upload the image. Other attachments are a little better, although you still have to open each one to save it. There are workarounds, but they require you giving varying degrees of access to third parties – something I’m not happy with. There are some things I can do on my Nexus 7 that you can’t do on a Chromebook. But as much as anything that’s because it has a more developed app community. Essentially you’re looking for people who want to develop Chrome extensions. This could be construed as quite a negative review. A poor screen and plasticky build quality; a keyboard that marks the screen; software that’s not ready for serious use. I know I’m being hard on it. In fact, it does what I wanted it do, and I’m very happy with it. I can get up and online or writing within second wherever I want. And that is it’s greatest and best quality. Improved build quality. Samsung has made this device to meet a price point, and I think for a bit more cash they could have toughened the case and not allowed the screen to touch the keyboard. Better Bluetooth support. In a Google cloud ecosystem, I should be able to stream music to Bluetooth speakers. Google Now built in. It’s taken me a while, but I’m really beginning to appreciate the power of Google Now. It’d be really good if Google kept an up to date list of voice commands somewhere (there are lists that claim to be complete, but they’re not!). There are rumours that it is coming. Other improvements will undoubtedly follow in due course with updates to the Operating System. In the short time I’ve owned my Chromebook, I’ve had three updates. Google seems to roll these out almost weekly. So would I recommend the Chromebook? A qualified yes. You need to know what you can and can’t do with it. And your needs will differ from mine. This is not a laptop replacement. I’d despair if it was my main computer. But as a second (or third) portable device for writing on? It’s excellent. I really do like the machine, and if you think that your productivity has perhaps suffered because you’ve switched to tablet from a laptop, then this is something to consider. If even a Tweet or Facebook status update feel a bit painful on the touchscreen keyboard of your tablet, never mind writing longer emails or documents, then this could be for you. I’d suggest that, if it was a bit more robust, it could be useful in an educational environment. For note-taking in a WiFi networked area, it’s excellent. But in general, if you just want a small machine that you can whip open at a moment’s notice to write a bit more of that work document, add another chapter to your novel, or get another few hundred words of your dissertation written, then you’d do well to look at this. 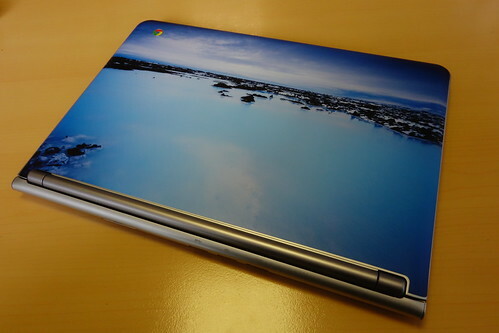 The chromebook looks really good but I’m worried about getting too locked into Google!